Sport: The good fishing continues with some super catches recorded and many quality trout caught with many weighing between 3lb and 5lb both rainbows and brownies. Roy Duckworth and Jim Cattermole had a good mornings fishing landing 8 trout between them. Roy and Jim fished by the jetty to tempt their fish with damsel patterns, both olive and orange being the favoured colours. A floating line worked best as they found the trout high in the water. Jamie Presho continued his good form with 5 fish taken from between Bell point and Hollins bay. Jamie caught his fish on both diawl bach and blue flash damsels. Mr consistent Bob Fitzpatrick was once again amongst the trout landing 6 whilst drifting up in Newclose bay and the northern shallows. Bob found the trout very close to the shore in shallow water and caught them on nymphs and blobs on a floating line and steady f o 8 retrieve. The jetty was the best spot for Brian Parker which is where he landed his 4 fish. Brian caught on a floating line and a combo of blobs and damsel. 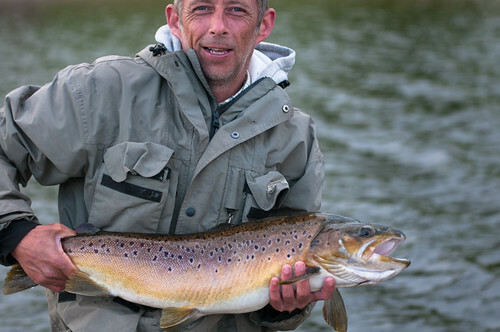 John Legg and Craig Whittaker had a red letter day amassing a total of 18 trout between them. They drifted all along the northern shallows and in Newclose bay to take their fish with either plain black or black and green lures being the best flies. They found a di3 sinking line the most efficient as this meant they could follow the trout up and down in the water column as conditions dictated. Jimmy Cottam took a walk and headed off to fish from the bank round in Newclose bay and was rewarded with a catch of 6 trout with rainbows weighing 3lb and a super brown trout that weighed 5lb. With the fish close to the shore in the shallow, recently flooded margins a floating line was his best option where he found the trout keen to take his small orange goldhead lure. Newclose bay also caught the attention of boat angler Ricky Newbolt and is where he caught his 6 fish catch. With Ricky being in slightly deeper water he found a ssi his best line with his fish taking a liking to a hot head damsel pattern. The water level has been slowly rising over the last week but the water clarity remains good and as you can see has probably triggered the trout into feeding more that they perhaps might. This next Saturday, 22nd, we will be hosting the annual Stocks n shares competition. Anyone who has fished this comp in previous seasons will know what a great friendly affair it is. It will be fishery rules regarding flies and will be fished over the front from drifting boats. The entry fee is just £10 in the pot, the fishery will also contribute, and your fishing fees. Anglers wishing to enter can call Stocks 01200446602. Syotw Paul. This entry was posted in Stocks Reservoir Fishing Reports on September 18, 2018 by staff.